The Samsung Duos line has been slowly working up the ranks to finally cross paths with the Galaxy S line. It's obviously not the kind of collision to create a big bang but we're still pretty excited about the exchange of DNA. Honestly, if it takes nothing less than a Samsung Galaxy S III to light your candle, there's little to see here. Dual-SIM phones are in a niche of their own and usually keep a safe distance from flagships, old and new. And no, the Galaxy S Duos hasn't crossed any lines but dares to do things a little differently. The Galaxy S Duos could easily pass for a Galaxy S III mini. It too runs the revamped version of TouchWiz dubbed Nature UX. It has two fully-functioning SIM slots, a 1GHz single-core processor and 768 MB of RAM. For a, hopefully, reasonable price you will also get a decent 4"WVGA screen and a 5MP still camera. Here's what else the Galaxy S Duos offers. Good looks and Ice-cream Sandwich are major points in favor of the Galaxy S Duos. It is clearly better than the Ace Duos in every way possible and will certainly cost a lot more. It would be a huge surprise for a dual-SIM smartphone to outsell a typical midrange droid and the Galaxy S Duos won't even be trying. But it's might be able to change the users' perception of dual-SIM phones and probably spur new demand. Frequent travelers and people looking to get the best out of multiple carrier plans are not after the ultimate in processing power or eye-popping screen resolution and the Galaxy S Duos is OK with that. It's offering reasonable equipment and good looks, on top of being able to handle two SIM cards. That's not a bad start for a phone that wants to do well in the midrange but we always like to have a closer look. Next stop is hardware and you're more than welcome to join us. 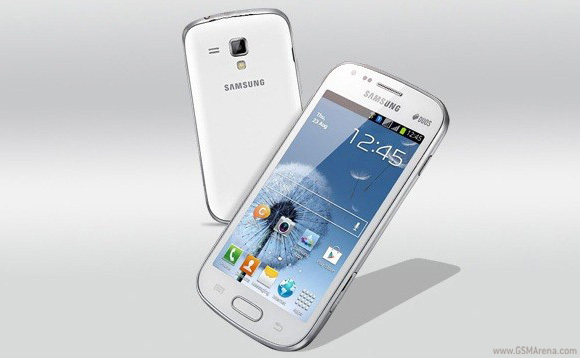 In many ways the Samsung Galaxy S Duos resembles the current Samsung flagship, the Galaxy S III. It's not as tall and not as thin of course, but the general aesthetics are undoubtedly influenced by the nature-inspired design of the S III. The Galaxy S Duos is a lot more subtle than its prominent sibling, most of which is down to the compact size. The good thing is it doesn't look like a cheap replica - far from it. In fact, the Galaxy S Duos is more sensible with the finish and does well without the high-gloss of the S III. The display on the Galaxy S Duos is a 4" TFT unit of 480 x 800 resolution, resulting in a density of approximately 233 pixels per inch. Those are some pretty good specs, considering the class of the smartphone. Colors and contrast are good but the unit is too reflective (as seen by the sunlight legibility score). Also the S Duos doesn't offer an automatic brightness setting as it lacks an ambient light sensor. The Samsung Galaxy S Duos comes with Android Ice Cream Sandwich and the latest TouchWiz UI, dubbed Nature UX - a premium combination that we saw on the Galaxy S III. We found the phone to at times choke badly on the heavy software but this could be just our pre-market sample. The lockscreen is a standard "tap and drag in any direction to unlock" deal and there're ripples accompanied by water-drop sound as you drag your finger. Four customizable shortcuts are available at the bottom of the screen - drag one up to activate the specific app. The dock at the bottom of the homescreen now fits five custom shortcuts or folders. The rightmost one opens the app drawer as usual, but you can change the other four to any shortcut you like or even a folder full of shortcuts. As usual, you can pinch to zoom out and easily manage homescreen panes - add, delete (but you can't have more than seven) or just reorder them. You can have 7 panes at most, which are enough to fit plenty of content even if you use widgets that cover an entire pane. The notification area offers quick toggles for Wi-Fi, GPS, Silent mode, Screen rotation and Power saving (which replaced the Bluetooth toggle). There are five more toggles just off screen. You can scroll them sideways to reveal more functions - Notifications (toggles icons in the top row of the screen), Mobile data, Bluetooth, Driving mode and Sync. The app drawer has a tab that lets you pull out widgets to the homescreen easily. Unlike stock ICS you cannot move between tabs by swiping through the pages - you have to explicitly hit the widgets tab. Some will find this more logical (scrolling past the available apps to find yourself in the widgets takes some getting used to). The app drawer has a zoomed-out overview too that lets you rearrange pages, but you can't create new ones. Hitting the menu key reveals some more options, including hiding apps or enabling tap to uninstall mode. The app drawer has three view modes - Customizable grid (where you can rearrange icons freely), Alphabetical grid (if you think you can find apps quicker if they're alphabetized) and Alphabetical list (this one makes shortcuts easy to hit, but isn't very space efficient). You can also view just the downloaded apps. Ice Cream Sandwich comes with various widgets and Samsung have added more still. Some widgets are resizable too - a feature we've seen in some custom UIs is now available natively in ICS. Once you get several apps running, you can use the task switcher to go back and forth between them. It's an ICS-style vertical list with a screenshot and a name for each app. Swiping an app sideways removes it from the list. There's a button at the bottom of the list to bring out Samsung's home-brewed task manager with a Remove all button. This is the quickest way to clear up both the list and some RAM. The Nature UX dressing on top of Android 4.0.4 looks great but it doesn't hold a candle to the one on the Galaxy S III. Though identical in look and operation, the Nature UX on Samsung's top dog relies on a quad-core Exynos processor to do the math. The single-core S1 chipset on the Galaxy S Duos didn't quite handle the Nature UX hassle-free. But this could all change when the phone becomes market-ready. We'll be first in line to check it out and report back. The Samsung Galaxy S Duos has a dedicated SIM Manager to configure how calls and data are handled on both cards. SIM cards slots are located underneath the back panel but not underneath the battery. When a new card is inserted, however, you still need to restart the device. Whenever you add a new SIM card and power the device on, an interface pops up allowing you to rename and even change the icon of any SIM card to more easily identify them. This interface can be accessed at any time from the settings menu. The Galaxy S Duos remembers the settings for any SIM you customize, which is great if you've got more than two SIM cards. The Galaxy S Duos allows for both SIM cards to be active simultaneously, meaning that you can receive a call on one SIM even while you are on a call with the other. What happens is that calls from your other SIM are forwarded to your currently active SIM's network, which you can put on hold to answer (this might incur additional network charges). You can put the two calls on and off hold as you please. You can toggle the Dual SIM Always On option on or off for either SIM card. Effectively, this enables call waiting and call forwarding so you can switch each SIM card on and off individually (which can help save battery). During a call, the active SIM gets displayed at the top of the call interface. You can also pick which SIM is to be used for mobile data - only one can be used at a time. Another option is whether or not the phone should be able to receive calls on the other SIM while using mobile data on one SIM. Smart Dialing is available and whenever you tap a digit and both contact numbers and names containing it are displayed. The catch is that name searching works with only the initial letter. On the other hand, number searching looks up recent calls too. If more than one contact is found, a button with a number and an arrow will display the rest of the matches. The Galaxy S Duos uses the Galaxy S III music player, giving users another reason to feel an extra bit more special. Music is sorted into various categories, but the most interesting one is called Music square - it's quite similar to the SensMe feature of Sony Ericsson phones. It automatically rates a song as exciting or calm, passionate or joyful and plots those songs on a square (hence the name). From here, you can highlight an area of the square and the phone will automatically build a playlist of songs that matches your selection. For example, if you highlight the upper part of the square the selected songs will be exciting and if your selection is centered around the lower right corner, the selected songs will be calm and joyful. You can swipe the album art left and right to skip songs. You can also put the phone face down to mute the sound or place your palm over the screen to pause playback. Samsung has enabled equalizer presets (including a custom one) along with the sound-enhancing SoundAlive technology, which features 7.1 channel virtualization. Samsung use SoundAlive in some of their MP3 and Android-powered media players. The track you're currently listening to is displayed in the notification area with controls for pause, forward and rewind. Touching the small album art icon will expand the music player. The lockscreen doesn't feature a music player plug-in but you still have access to the notification area from there so it doesn't matter. The sound on the Galaxy S Duos was okay but we'll wait until we get our hands on a final release unit to pass judgment on the actual audio quality. The Samsung Galaxy S Duos comes with a 5MP camera and is able to capture photos at a maximum resolution of 2560 x 1920 pixels. The interface is virtually the same as on the Galaxy S III - You get two shortcut bars on each side of the viewfinder - on the right you get the still camera / camcorder switch, a virtual shutter key and the gallery shortcut (which is a thumbnail of the last photo taken). On the left you get several controls and the good news is that you can pick any four shortcuts to put there - you can easily have all frequently used features just a tap away. The fifth shortcut always points to Settings. The actual images are good with a pleasing colors and good dynamic range. The noise is kept reasonably low, but there's quite some fine detail that gets eradicated in the process. Even if this is the best Samsung can get out of the Galaxy S Duos we're not complaining. The images look good enough, especially considering that this is not a camera-centric device. We could still see improvement once the final unit arrives into our office. The Galaxy S Duos gets a C for the effort in video recording, but nothing more. It captures video in VGA resolution at around the 30 fps mark. The bitrate of the videos hovers around 3300 kbps. The camcorder interface is almost the same as the still camera's - you get the same customizable panel on the left for up to five shortcuts. The Samsung Galaxy S Duos has the ICS version of the Android browser, which is one of the last ones before Chrome takes over the show entirely. Naturally, you have the option to install one of the other third party browsers available at the Play Store, including Chrome as the Galaxy S Duos is a 4.0.4 device. The browser supports both double tap and pinch zooming along with the two-finger tilt zoom. There are niceties such as multiple tabs, text reflow, find on page and so on. A neat trick is to pinch zoom out beyond the minimum - that opens up the tabs view. We had issues with the Flash support on the Galaxy S Duos but this could again be the non-final software to blame. Otherwise there's no reason why the S Duos might have trouble with Flash content. The ARMv7 chip in theory supports Adobe Flash. The Web browser comes with Incognito mode, which enables you to surf the web without the browser keeping track of your history or storing cookies. You can also switch to a more minimalist UI, which currently is in a Lab stage. It disables most of the browser's user interface and gives you a quick five-button layout to access the basics. The Samsung Galaxy S Duos picks up where the Ace Duos left off - and has built more smartphone muscle around the dual-SIM bone. A bigger and better screen and more processing power are sure to please the more demanding users, and the Galaxy S III inspired design is the best thing that could happen to what's more or less a niche device. On the "smartphone" side, the S Duos is hardly more than a low-end phone but its ICS platform helps it score a few extra points. The "dual-SIM" support puts the whole thing in a different perspective. Devices that handle two SIM cards target a specific audience and the dual-SIM smartphones are usually basic, affordable packages. The Samsung Galaxy S Duos aims a little higher, but is smart enough not to venture in too hostile territory. There's a bit of work still to be done on the Galaxy S Duos. Some things need to be ironed out while others simply need fixing - like the lack of proper Flash support in the browser. Overall though there's nothing more serious than the usual bugs of a beta unit, which should be sorted by the time the Galaxy S Duos is ready for primetime. Having laid our hands on it we can safely say that this is a device with some potential and we'll be keeping an eye on it in the following months.